A Journey AAG to AAS 1993 – 2003 "Transforming Vision into Action" Published by AAS, 2003. 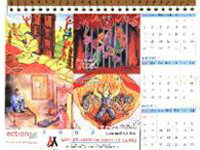 Calendar 2003 published at Word AIDS Day 2003 on the Theme of “Stigma and Discrimination” based on the posters made by the students. Mid Term Evaluation Report October 2000, (Health Promotion Training Programme AIDS AWARENESS GROUP (AAG)) Published by Save the Children Fund UK, 2000.